But taxing the higher education sector to improve the schools suggests that universities are overfunded. Really? What is the evidence? Looking at the funding that Western Australia is tagged to get, even if they sign up, they lose about $760m to gain $300m. This is Labor redistributing school funding from states hostile to labor to the battleground states to save a few seats. The Government could solve this funding problem without touching the Universities. Stop throwing good money after bad by stopping the flow of Aid money out of Australia. $8.1 Billion, wasted. As a past university student, I have studied externally, internally, part time, and full time on and off campus at three Australian universities. Never to my knowledge has any sector of the economy been in more desperate need of a financial shake-up than our universities. Replete with redundant and redolent tenured academics gabbling long prepared lectures and dreaming of their next sabbatical, equally replete with lazy students with neither the capacity nor intention of taking a degree other than in beer swilling, and offering a plethora of hat-making and basket weaving courses, useless counselling services, and top heavy administrative staff levels - all with with no likely benefit to the long suffering community that supports the system. Few academics work to a well prepared lesson plan, and even fewer practice basic classroom control so that many lectures are little more than student talk-fests - so much so that many genuine students actually avoid some lectures. Go for it Julia - a substantial reduction in financing might well force the powers that be (such as the author of this article) to a much needed re-evaluation of higher learning outcomes - perhaps even prune the dead wood. Last evening on Radio National a commentator, bemoaning Julia Gillard's university efficiency dividend, revealed that he was associated with a university which offered two off twelve week semesters per annum. The commentator also revealed that overseas universities offered two off sixteen and even eighteen week semesters per annum. In those overseas universities an undergraduate course could easily be completed in one less year than in Australia. 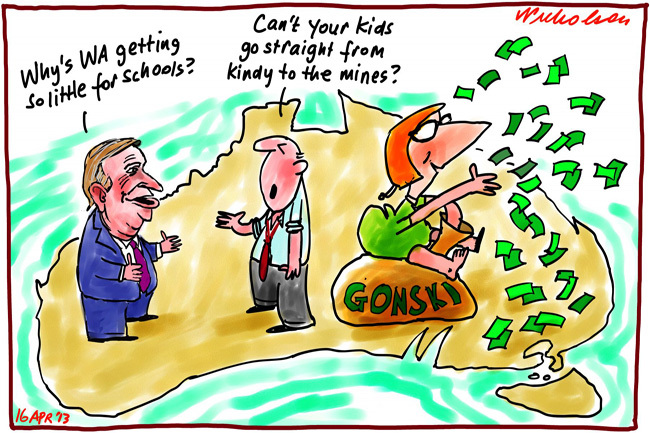 Such a system here would probably save enough to fund the Gonski proposals. Another way to make some savings would be to dispense with all funding of school chaplains. Also many courses in Australian Universities are dumbed down to an extra ordinary degree. One example I am aware of is a computer science course which initially included four semesters of Mathematics (48 weeks) but now has one semester. Business Studies is a course that could be completed part time at TAFE and both students and taxpayers would be much better off. As a senior accountant in one very large Australian company once commented to me; "I did accountancy because I wasn't good enough at maths to do engineering." University degrees should be only available in difficult front line subjects, not in subjects which can be studied adequately in simpler, more efficient ways. I'm with you GYM-Fish & Foyle. I did my Computer science course at TAFE. Most of it was taught by a Uni Professor who was only interested in pushing his own programme that he had written & he was only interested in Unix. I asked him, "Why Unix? & he said that that real computer people only work from, the word escapes me, green screen. For Maths we did "Surds" I still haven't figured out we were supposed to do with that. Strangely not many people passed his course & sorry no refund. He lived in a world of his own. My other gripe is the Arts Courses. Some these courses offered are completely useless in the real world. But you do come out of Uni with a degree. Social Coursed are full of men hating feminists who have been through the TAFE feel good courses, They have been dumped by their husband's because they are "nutty" Then go on to Uni to learn how better to blame men for everything. The only people they associate with at Uni are other Nutters who have had the same problem with their husband's. Therefore all men are ar$e$o(e$. Then if you don't attend "X" many demonstrations then you will fail the course. I don't see what "Ancient English into Old English" (old girlfriend)is good for unless you are going to go that way either, she didn't, but has a degree. The cost of these courses should double & the courses for Science, Engineering & Doctors should be cut by half. thanks for giving me hope that there are people out there who can still think.